Fourth Row Center: Film Writings by Jason Bailey: On DVD: "Breaking Bad: The Complete Third Season"
By my count, there were three episodes in the third season of Breaking Bad ("One Minute," "Half Measures," and "Full Measure") in which the closing scene is literally gasp-inducing. It is neither new nor noteworthy that the series is tense--from its opening scene of its first episode, Vince Gilligan's drug drama has frequently been tautly suspenseful, almost unbearably so. But it's not just empty tension. There is an inevitability to the events as they unfold; terrible things happen, but seldom out of nowhere. One thing leads to the next that leads to the next, and so on. 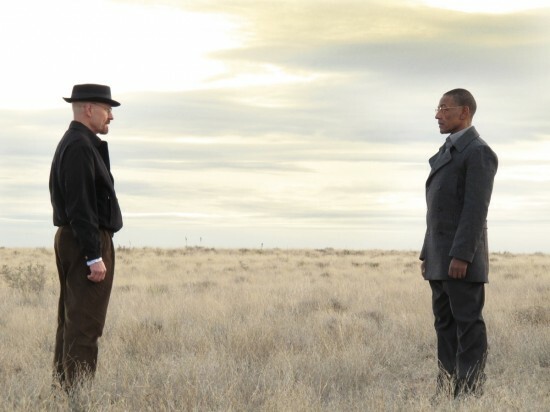 Late in the season, Walt chastises Jesse thus: "Jesse, your actions... they affect other people." That could very well be the show's credo. Seasons one and two introduced us to Walter White (Bryan Cranston), a high school chemistry teacher who has been diagnosed with lung cancer; in a desperate attempt to leave money behind for his wife Skylar (Anna Gunn), son Walt Jr. (RJ Mitte), and newborn daughter, he talks a burnout former student/drug dealer, Jesse (Aaron Paul) into joining him in a scheme to "cook" crystal meth. As the plan progressed, Walt found himself not only a gifted drug maker, but a surprisingly savvy businessman and criminal--when able to maintain his tenuous moral compass and evade his brother-in-law Hank (Dean Norris), who is (of course) a DEA agent. As the third season begins, things are pretty much a mess. Though Walt is in remission, he and Skylar have separated; Jesse (Aaron Paul) is in rehab, still wrecked by the overdose death of his girlfriend Jane (Krysten Ritter). Walt's school--and the city of Albuquerque in general--are reeling from a shocking plane crash. Walt's business arrangement with Gus (Giancarlo Esposito) is both his blessing and his curse; Gus offers him a small fortune to oversee three months of cooking in a high-tech, industrial lab, and his association with Gus offers not only fiscal but practical security. You see, there are these cousins of Tuco who are out to avenge his death, and they hold Walt responsible. But he works for Gus now. Ah, what a tangled web, etc. Creator Gilligan and his talented writing staff continue to understand that the key to the show is in the complexity of the personal relationships, and find ways in season three to push them even further. Walt and Skylar's strained marriage finally comes to a breaking point; he confesses his income source, she demands a divorce, and their uncomfortable power struggle becomes one of the season's most quietly powerful threads. Watch the scene, towards the end of the season, when they stand in the driveway and negotiate their family dinners--you can cut that subtext with a butter knife. The series (and actors) also continue to effectively mine the complexity of the Jesse/Walt relationship, which veers wildly from outright exasperation to fierce protection. They really have invested the duo with a father/son dynamic, and all of the complexities therein. The ensemble cast is (somewhat impossibly) even sharper and more finely tuned this season. Cranston is, of course, brilliant; this is known. Gunn continues to surprise in what is probably the show's trickiest role. Norris keeps getting stronger, his character's shifts allowing him to tap into a deep well of rage over the course of the 13 episodes. Betsy Brandt has been frequently underused, but gets some juicy material in relation to the trials and tribulations of Dean; she also gets the season's best comic beat, when she finally figures out a way to get him out of the hospital. Bob Odenkirk and Giancarlo Esposito are both bumped up to full-fledged regulars this season, and that's good news indeed--Odenkirk's slimy shyster adds a note of levity (but never plays like anything as simple as "comic relief"), while Esposito can make your blood turn cold with just a look, or a deceptively flat line delivery. And then there's Gale (David Costabile), poor Gale, who is the season's closest approximation to a sympathetic character, with an open face and gee-whiz enthusiasm that is, ultimately, heart-breaking. Also well-used is the great character actor Jonathan Banks (or, as I always call him, "that one creepy guy from Beverly Hills Cop") as Gus's utility man Mike, who delivers a chilling monologue ("I chose a half measure when I should've gone all the way") that drops the tumblers for the rest of the season into place. It is often noted these days--usually with despair--that artists who really want to tell stories barely even bother making movies anymore; the business of movies these days is merely the recycling of "brands" (in 3-D, if possible) to make a fast, opening-weekend buck. The storytellers go to television now--most often to cable, where networks like AMC, FX, Showtime, and HBO are apparently still interested in engaging audiences with well-written stories and complicated characters (old-fashioned, I know). Like the best shows of recent years--The Wire, Mad Men, Lost--the writers of Breaking Bad use the broad canvas of the serialized narrative to tell big, powerful stories, and to take chances; the little sketches that open the show's third season episodes (flashbacks, sidebars, and the like) fill in the details of the world that the characters inhabit, and remind us of lives lived before, after, and outside of the frame. But more than anything, Breaking Bad is potent, powerful television because it is an accumulation of events--things in this world don't just go away, so a shooting in season two that we may very well have forgotten entirely suddenly becomes the inciting event at the end of the third, the spring that pushes Walt and Jesse to irrevocably pass the point of no return. Have the storytellers really given up on movies? Well, I'll tell you this: the last two episodes of Breaking Bad's third season are better than any movie I've seen this year. These 13 episodes leave little doubt; this is the best show on television. "Breaking Bad: The Complete Third Season" hits DVD and Blu-ray today.